The Osmo Pocket is the smallest 3-axis stabilized, handheld camera that DJI has designed. It will actually fit in your pocket like the name suggests. The Osmo Pocket uses a “gimbal,” which is a tool in videography that uses a set of motors and sensors to keep the camera steady. A gimbal is like a small, handheld tripod. The result is smooth footage while maintaining the ability to move around the scene. In real time it precisely adjusts for your movements like uneven walking or shaking hands, making any video turn into a movie-like scene. ActiveTrack: A user taps on the subject on the screen and ActiveTrack follows the subject. Panorama: Captures a detailed scene in 3x3 panorama. Motionlapse: Timelapse turns hours into seconds, and Motionlapse smooths the movement for dramatic effect. Nightshot: The Osmo Pocket automatically detects and illuminates a low-lit screen. 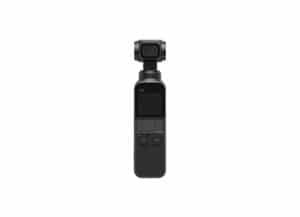 DJI announced the Osmo Pocket and opened up pre-orders on November 28, 2018 with the release date set for December 15, 2018. The device costs $349 (£329, AU$599), cheaper than the GoPro Hero 7 Black. SD cards are not included and will need to be purchased separately.